For other people named Tommy McCarthy, see Tommy McCarthy (disambiguation). Thomas Francis Michael "Tommy" McCarthy (July 24, 1863 – August 5, 1922) was a Major League Baseball player. He was elected to the Baseball Hall of Fame in 1946. McCarthy was born on July 24, 1863 in Boston, Massachusetts, the eldest son of Daniel and Sarah McCarthy. 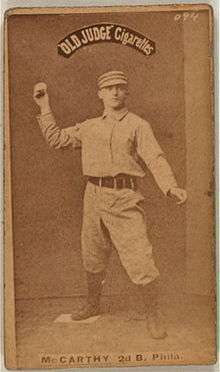 McCarthy joined the Boston Reds in the Union Association in 1884 as a starting pitcher and outfielder. In limited innings and at-bats, he played poorly, batting at a paltry .215 average, and lost all seven of his pitching appearances. McCarthy moved to the National League and played with the Boston Beaneaters the following season and the Philadelphia Quakers the following two years but failed to bat higher than .200 in any season, although in limited at-bats. Setting aside aspirations of being a star pitcher, McCarthy finally settled into an everyday position in a lineup in 1888 with the St. Louis Browns in the American Association. With the Browns until 1891, McCarthy scored over 100 runs each season and grew increasingly productive at the plate. He batted .350 in 1890 and drove in 95 runs in 1891. Although the shoddy record-keeping of the time prevents an accurate tally, he also asserted himself as a daring presence on the base-paths, by some accounts stealing over 100 bases in 1888 and approaching the mark in 1890. 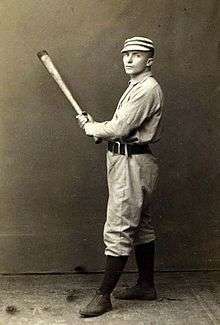 McCarthy moved back to the National League to play for the Boston Beaneaters in 1892 and enjoyed his most productive seasons over the next few years. In 1893 he drove in over 100 runs for the first time in his career, a feat that he repeated in 1894 while hitting 13 home runs. The press of the day called McCarthy and teammate Hugh Duffy the "Heavenly Twins". Their Boston team was one of the most successful clubs of the era. McCarthy played for the Brooklyn Bridegrooms in 1896 before retiring. He finished his career with a .292 batting average, 44 home runs and roughly 500 stolen bases. McCarthy's selection into the Baseball Hall of Fame in 1946 has always been a controversial one due to his less than spectacular statistics, especially when compared to those of his fellow inductees and some players who have not yet been honored. In his Historical Baseball Abstract, Sabermetrician Bill James makes the point that McCarthy was held in such high esteem because of his introduction of the "hit and run" play into the game. This play, among other novel strategies (such as batter to baserunner signals, etc.) that he and his Boston teammates utilized, were a clever and gentlemanly counter to the rough and tumble "Baltimore" style of play which was, at the time, giving baseball a bad name. Nevertheless, in the same book, James also said that McCarthy is the worst player in the Hall of Fame. ↑ James, Bill. The New Bill James Historical Baseball Abstract, 2000.